When eastern pioneers arrived in what is now California, they found a sparsely-settled land with a few Spanish ranchers and a Russian settlement that farmed mammals from the sea. In 1846, following the successful "The Bear Flag Revolt," American settlers removed these powers. Two years after a major 1848 gold strike east of Sacramento began to draw emigrants westward, California was made a state. Roads for wagons were scarce, so survey teams were sent to locate suitable routes, find reliable water supplies and eventually to survey railroad alignments. In 1853, Robert S. Williamson's survey team stopped here. During another railroad survey in 1854, Lt. Amiel Whipple first named Soda Lake, from which Soda Springs gets its name. 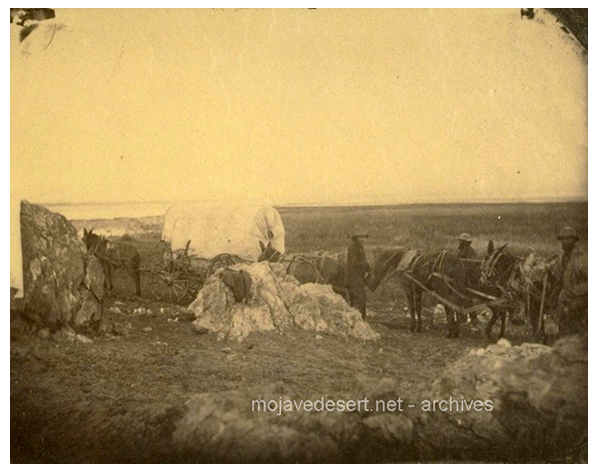 In 1857, one year before the Butterfield Overland Mail began running between Missouri and California along the Great Southern Route, Edward Fitzgerald Beale established the Mojave Road, a more-northerly freight and postal route across the desert. Camels, imported from the Middle East, were used as pack animals along the Mojave Road as part of the U.S. Army's Great Camel Experiment. After walking from Texas over rock-strewn trails, Beale's camels were pronounced capable. The Army, however, abandoned its "ships of the desert," partly because the great shaggy, spitting beasts scared every horse and mule they met half out of their wits!